Includes Stainless Steel collector 54mm-60mm-72mm with Titanium Silencers, all hardware, springs & instructions. Weighs in at 8 lbs (titanium) compared to the stock exhaust at 14 lbs. Available in aluminum and titanium. Installs in less than 1 hour. Includes springs and carbon hangers. No remapping required. 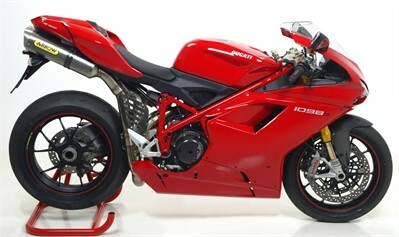 Adds about 6-10 hp and makes it sound like a Ducati should.